Incomplete blocking such as 3C2, 4C2, 5C2, 6C2, 7C2, 8C2, etc. when Samples >=3, and presenting only two samples. The scales on this Web page are not interactive. Incomplete block paired comparisons is also commonly referred to as multiple paired comparison, multiple paired preference, pairwise ranking, and incomplete block paired preference. Primary method for doing Incomplete block paired comparison in your SIMS sensory panel software. - Hedonic; using SIMS hedonic attribute types, "select one", attribute seen with last relative sample. Alternative; Pairwise Ranking, SIMS ranking attribute type, "rank all". The rest of this webpage discusses the primary hedonic method. Set up the ballot as an Affective questionnaire using Hedonic attributes. Affective questionnaire will allow for more flexible Incomplete Block Experimental Design and Experimental Plan Rotations. Create an Hedonic attribute type with two choices and label the choices them with the following special TAGs. The above example will present two choices with the blinding codes for the two samples in randomized order perfectly matching the Rotation Plan in the Test Definition. Example: Which Sample do you prefer OVERALL? Note: The "Attribute Seen With:" option should be set to "Relative Sample -- Last Sample", so that this question is only seen once at the end of the ballot. Note: Other handy TAGS are available as with all questions types in your SIMS sensory panel software. See the [Notes] buttons. Note: We have sucessfully tested this method with bigger BIB designs, such as 5C3, 8C4, etc., add some hedonic choices, see same reports. Set up your Experimental Design specifying the true absolute number of samples, which is 3 or more for incomplete blocks of PC tests. Select an Experimental Plan, such as Combination 3 choose 2, or create your own. Number of samples presented is always 2 for PC. The Design can be either a Balanced Incomplete Block (BIB) or an Unbalanced Incomplete Block (UBIB). In a BIB Design, there are m = t(t-1)/2 possible pairs, such as for a 3C2 test there are 3 possible pairs, 4C2 6 pairs, etc. You may need to create balanced SIMS Experimental Plan, example for 4C2, 12 pairs, 12 34 13 24 14 23 21 43 31 42 41 32. Create your Test Definition and review your Rotation Plan report in SIMS for accuracy. As always, "Test Your Test". This is an advanced type of question and setup, some attention to details is required for data interpretation. The raw panelist data saved is the actual 'return values', just like every hedonic question type in SIMS, therefore the raw data return values are *not* the Sample #s, they are positional orders. • SIMS Raw Data Export Report, by default, the columns for these hedonic questions will display the actual 'return values', not the sample selected. Recommended: Your SIMS Raw Data Export Report can optionally swap in the blinding-code associated with each panelist response, this may only be beneficial for interpretation if your experimental design selected the option for the Same Blinding Codes for all panelists. See the report's Column Options tab to set this. Alternative: The raw data can be interpreted by reviewing the actual return values from each of your panelists while also reviewing which sample set pair the panelist was presented with from the Test Definition Rotation plan. 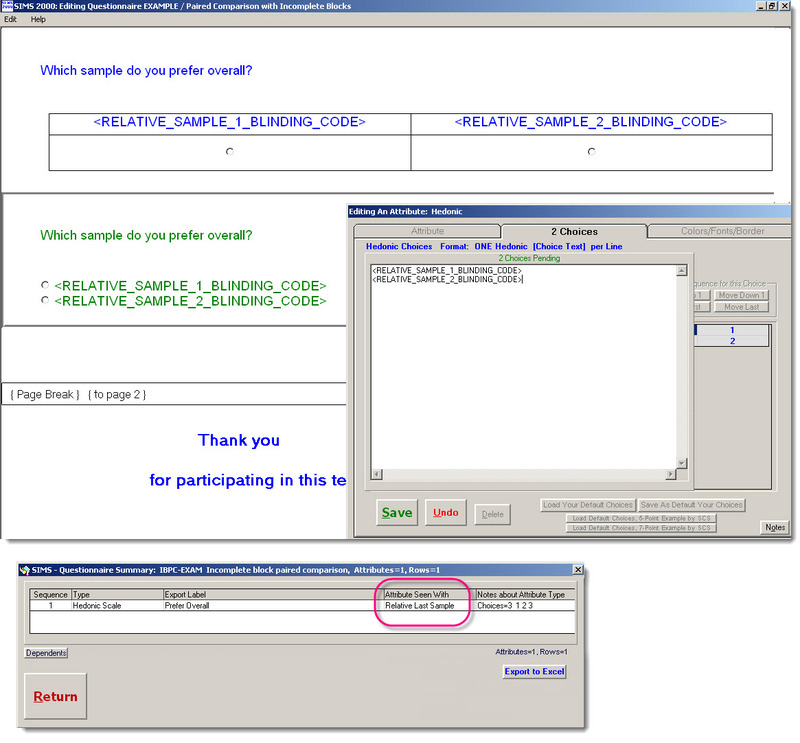 • SIMS Data Frequency Reports will add additional report lines interpreting the data when these Special Hedonic Sample Choice Tags in Use is detected. Example:   This design was 4 samples. Balanced Incomplete Block Paired Comparison (BIBPC). The experimental design was 4 samples, 2 presented, 1 reps.  4C2R1. 48 panelists and 48 pairs evaluated. Each panelist 1 pair. Ballot PCN attribute included a No Preference option, see example print screen above. The Frequency grid of Selected vs Non-selected Absolute Samples. Read the grid from Left to Right. Example:  S1 selected over the S2, head-to-head, n times, and %. Summary of No Prefer/Other selected over any Sample presented. The experimental design was 4 samples, 2 presented, 3 reps.  4C2R3. 10 panelists and 30 pairs evaluated. Each panelist 3 pairs. • The SIMS sensory panel software Test Data Results Reports will add additional report lines interpreting the data when these Special Hedonic Sample Choice Tags in Use is detected. - Select option: [X] Show Affective Incomplete Block PCs. Select your desired sample pair for analysis. • For additional advanced analysis, use your own Incomplete Block Paired Comparisons statistical calculations using the raw data and proper data interpretation. • Other reports in your SIMS sensory panel software may need to be scrutinized for proper data interpretation.